Pelletron Charging System - National Electrostatics Corp. 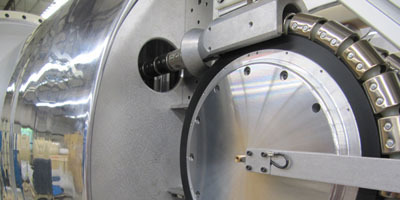 The Pelletron charging system is the heart of NEC’s accelerator technology. 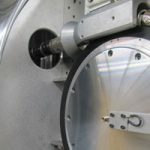 Due largely to the unique Pelletron charging chain, the Pelletron charging system is an all-around superior alternative to other accelerator charging systems in efficiency, longevity, durability, stability, and cost and difficulty of system maintenance. 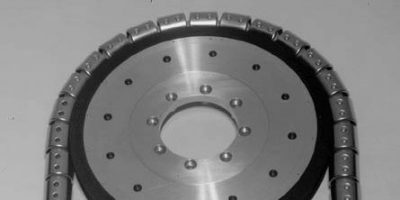 The Pelletron charging chain used in NEC accelerators was developed in the mid 1960s as an improvement over older Van de Graaff charging belts. These belts suffered from a number of operational difficulties, including terminal voltage instability and susceptibility to spark damage. The rubber belts also generated dust, which necessitated frequent system shutdowns for cleaning inside the accelerator tank. The Pelletron chain rapidly proved to be more durable than the old belts, producing a greater terminal stability than previously possible, and eliminating the belt dust problem. The chain does not limit ultimate terminal potential, and it is in use in electrostatic accelerators up to and above 25 MV. In addition to the belt-driven Van de Graaff, Pelletron charging systems also offer significant advantages over solid-state charging systems. These systems depend on fragile electronics in the high-voltage column, prone to problems that are both difficult to diagnose and expensive to repair. Because they are susceptible to spark damage, solid-state systems also require a long period to condition up to rated voltage. Pelletron chains are made of metal pellets connected by insulating nylon links and are charged by an induction scheme that does not use rubbing contacts or corona discharges. For a positive terminal (single ended) Pelletron, the negatively-charged inductor electrode pushes electrons off the pellets while they are in contact with the grounded drive pulley. Since the pellets are still inside the inductor field as they leave the pulley, they retain a net positive charge. The chain then transports this charge to the high-voltage terminal, where the reverse process occurs. When it reaches the terminal, the chain passes through a negatively-biased suppressor electrode, which prevents arcing as the pellets make contact with the terminal pulley. As the pellets leave the suppressor, charge flows smoothly onto the terminal pulley, giving the terminal a net positive charge. Most Pelletrons employ “down-charging” as well as “up-charging.” Down-charging works identically to up-charging, except the inductor/suppressor polarities are reversed, and it effectively doubles the charging current capacity of the chain. For the configuration shown here, small, slightly-conductive “pickoff pulleys” provide the voltages for the terminal suppressor/inductor electrodes by drawing a tiny amount of charge from the chain, each pulley thus biasing the opposing electrode. This technique allows down-charging without the use of HV power supplies in the terminal. Depending on the particular design options, the system delivers charging currents of 100 – 200 µA or more per chain to the high voltage terminal. 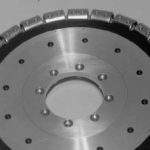 The drive pulleys, typically 30 cm to 60 cm in diameter, and motors are supported on movable platforms that are counterweighted, automatically providing proper chain tension. Over 250 Pelletron charging systems are currently in use in dozens of countries around the world as part of electrostatic ion beam accelerators. The vast majority of these are complete NEC accelerator systems, designed for a wide range of applications including accelerator mass spectrometry (AMS) and ion beam analysis (IBA). However, Pelletron charging systems are also available as upgrades to the belt-driven Van de Graaff charging systems in a number of HVEC accelerator models, including ESTU, MP, FN, and EN. Please contact NEC if you are interested in replacing a belt-based system with a Pelletron charging system.